It may be the case that Canada’s capital Ottawa has one of the least developed and inaccessible shorelines anywhere in the world, but that doesn’t deter people from fishing. In spite of the limited shoreline access, we anglers still manage to partake in their sport in sight of Canada’s federal legislators and public service mandarins. No Doubt, fishing with friends after work is a great way to end the day. Spring fishing for catfish off Victoria Island behind Ottawa’s Parliament Hill is one of many urban fishing options the city of Ottawa offers. These cats can reach upwards of five kilos. Bring a lawn chair, some heavy 2-3 oz. weights, size 1/0 non-offset circle hooks, a stout rod and some worms. Tie your rig so the line can slide freely through the weight by putting the weight ahead of a swivel, then attach your hook to the swivel using a 12-inch section of heavy 20lb mono. You can use a rod holder and bell on the rod’s tip, but don’t forget to slack off the drag first or you may lose the whole rod. Or, hold the rod, put the reel on cast, and feel your line for movement. It will either jerk or simply tighten. 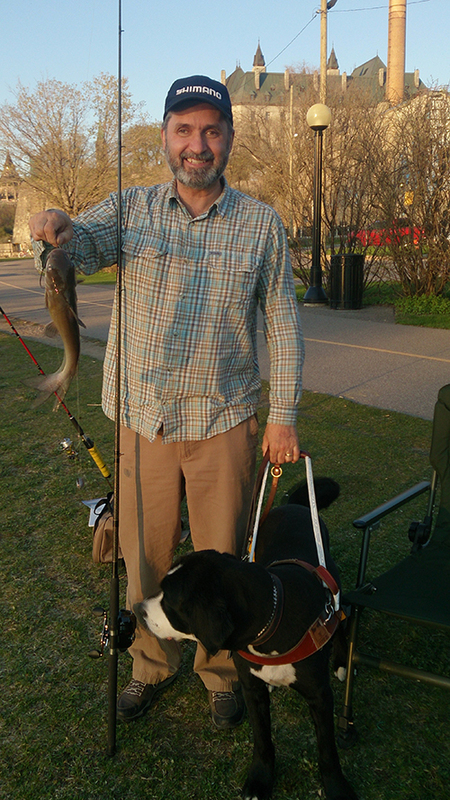 When a catfish takes, gradually tighten the line and the circle hook will do the rest. No need for a hook set. The fishing is best around sundown. However, the comradery is always good no matter whether the fish are biting or not. You can spend a lot and fly in to some remote wilderness resort, or you can just pull out your grandparent’s old fishing rod from the back of the closet. It doesn’t have to be fancy or expensive. Follow me on Twitter @lawrencegunther, and catch my Feel the Bite Videos and Blue Fish Radio shows at www.lawrencegunther.com.